Base Ball on the Western Reserve is a comprehensive history of 19th century base ball in Northern Ohio. The book was painstakingly researched by author James Egan Jr., a Clevelander, who spent nearly 15 years combing publications and microfilm of every newspaper article in Northern Ohio for articles concerning the game of base ball. He has been called “The Indiana Jones of Cleveland Baseball”, and after you read the book, you’ll know why. Mr. Egan not only covers the major base ball teams of the era, such as the Forest City’s, Cleveland Blues and Cleveland Spiders, but has documented local amateur clubs and games as well. His book is ordered chronologically, with chapters divided into subsections detailing any baseball events during the year. Although the book is more like an encyclopedia, Egan provides commentary, and sprinkles noteworthy vignettes throughout the scores of ball grounds descriptions and box scores. 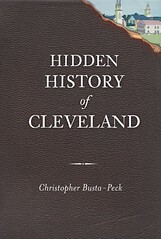 The book is a must read for baseball historians, and includes great context for the game of base ball by detailing what was happening in the Cleveland area at the time. For example, Egan writes about how the Cleveland Blues of the National League were trained by Professor Rumsey, the self-professed “King of Excerise”, and how they trained at the Waring Block Building, which still exists today. Egan also provides many great pictures and illustrations. For example, an opening day drawing of League Park from 1891 is in the book as well as a cartoon of the event, published in the Cleveland Press. Pictures of old Cleveland ball clubs, and 19th century base ball cards litter the book as well. 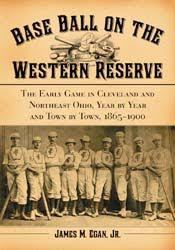 The book’s full title is Base Ball on The Western Reserve – The Early Game in Cleveland and Northeast Ohio, Year by Year and Town by Town, 1865-1900. It is published by McFarland & Company, Jefferson, North Carolina and London. It can be purchased on Amazon.com, or directly through the publisher's website. Egan is a small business owner in Cleveland, and is working on his second publication, which will detail early Cleveland Indians baseball.